Animal Disguises is a book filled with a plethora of information about the cleverness of animals and how they survive and protect themselves in the wild. 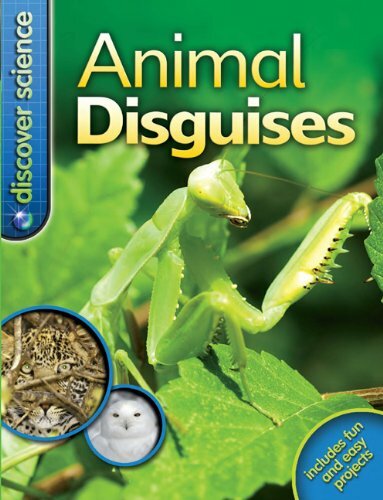 Similar to the other books in the Discover Series, Animal Disguises has a table of contents in the beginning of the book for easy reference. Each topic is broken down individually. The first main topic covered is camouflage. From explaining what camouflage is, from how animals blend in with their environments, whether by patterns on their coats or skin, or their color, or their. It also includes pictures of various animals that perfectly complement the text. Then we explore animals that match their environments so seamlessly that one would never know they were there until stumbled upon. Some animals live in leaves, hide themselves in fruit and flowers, disguise themselves within rocks, or even imitate tree branches. Camouflage can be achieved in various ways. Some animals use counter-shading as an element of surprise, especially those animals that can be seen from the sky as well as from the water. Certain animals undergo a color-change phase. In the summer certain animals are brown to match their dry environments, while in winter their coats will change to white to match the snow. We cannot forget the animals that are color shifters. These critters can change color to match their environment in a matter of seconds. When changing color or shape will not do, other animals will cleverly disguise themselves by adding their shape whatever happens to be around them. There are many animals whose bodies were designed to trick a predator or prey, whether it is to save themselves, or to get food. Some animals play dead, inflate, display color, or set traps. Snakes, turtles, and fish all have their own ways of tricking prey into being their next meal, while others copy the adaptations of poisonous animals to keep them safe. At the end of the book, there is also a crafts section, a glossary, parent and teacher notes, a section on factoids, and an animal disguises quiz to check on reading comprehension. Overall, this book did an excellent job adding just the right amount of information to appeal to readers enough to keep their interest without bogging them down with too much detail about one specific animal. The photographs provided images sufficient for allowing the reader to see some of the changes or adaptations discussed. Children who have enjoyed the other books in the Discover Science Series will not be disappointed with this one. Though this series is meant for children within the ages of 9–12, younger children in grades K–3 will also enjoy this book. Animal lovers will be amazed at how these creatures can adapt to their environments, increasingly appreciating the diversity and ingenuity in the animal kingdom.